TaRoNiS Ransomware is a file encrypting malware that has been developed to intimidate and receive ransom money from affected users. Ransomware are increasingly becoming popular as means to damage files and systems which could be due to easily transaction of cryptographic currency through online web based medium. Cyber-criminals are constantly trying new and updates sources to infect systems all over the globe. TaRoNiS Ransomware uses spam mails to trap users into believing the legitimacy of their contents. It uses design layouts of popular firms and respected brands to serve alarming information regarding a particular product or a service that might catch immediate attention of unaware users. The subject-line text of these messages is creatively crafted to serve this purpose. 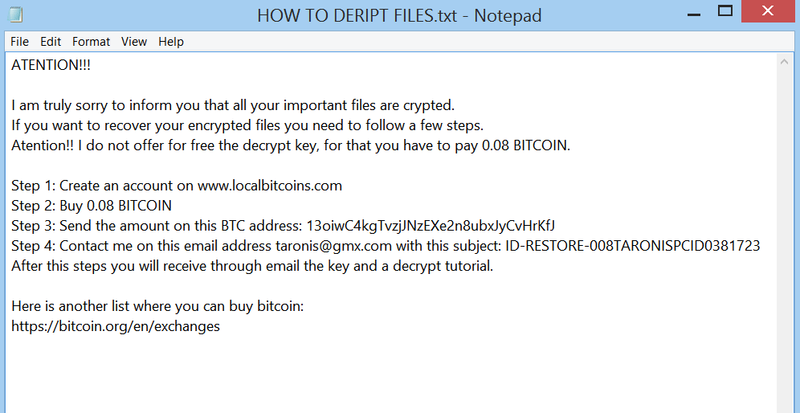 The infectious payload containing TaRoNiS Ransomware has an executable file. It is embedded as a macros feature within the documents of these messages, which are served as an attachment file. Users can enable its deployment upon clicking on the option to enable macros to fully read the document. It can even be obtained while users are carelessly browsing web and click on a suspicious link, usually while using illegitimate websites. TaRoNiS Ransomware can also be installed from software packages that usually promote freeware applications as a bundled-up option. It can silently intrude the system and quickly encrypt crucial files. TaRoNiS Ransomware is capable of encrypting files such as backup, documents, databases, audio, video, images and texts. Soon these files can be identified as carrying an extension '.TaRoNiS' and thus get renamed. The files then become unrecognizable by the operating system and are unusable for users. The ransomware has been found to delete Windows shadow volume copies that makes it even more difficult to retrieve encrypted files. It can even make changes to system settings that can make it difficult to restore windows backup. TaRoNiS Ransomware has been found to make changes in the windows registry settings that allows it to remain and encrypt files unless a private decryption key is obtained. It leaves a ransom note for this purpose as it informs users regarding payment of 0.08 Bitcoin at a given address. It also asks users to contact developers at '[email protected]' to receive the key and a decryption tutorial. Users should not carry out such steps, instead they can remove it by following the steps given here. Go to Precess tab, find the TaRoNiS Ransomware related Process. Choose and remove all TaRoNiS Ransomware related items from list. Find and delete TaRoNiS Ransomware related items from the programs list. Select and Remove all TaRoNiS Ransomware related programs. Select and remove all TaRoNiS Ransomware related entries. Hope the above process has helped you in removing the TaRoNiS Ransomware virus completely from your computer. If you still have this nasty ransomware left in your PC then you should opt for a malware removal tool. It is the most easy way to remove this harmful computer virus from your computer. Download the Free TaRoNiS Ransomware Scanner on your system and scan your computer. It can easily find and remove this pesky ransomware threat from your PC.